For years, one character has cast an ominous shadow over the British comics scene. Created in 1977 by the Scottish writer John Wagner and Spanish artist Carlos Ezquerra, Judge Dredd, has become one of the most influential British comic exports of modern times, as well as the byword for police brutality the world over. 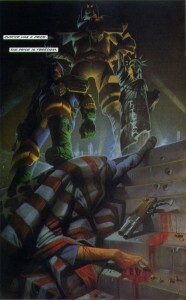 First appearing within the second issue of the iconic anthology comic 2000AD, the character has gone on to appear in a variety of different media forms, including novels, board games and even two motion pictures: one good (Dredd, 2012), the other, well, not so good (Judge Dredd, 1995). 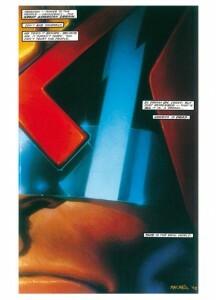 With such a rich comics heritage, mining the creative minds of such writers as Mark Millar, Grant Morrison and Garth Ennis, among others, Judge Dredd has managed to prosper as one of the most potent and continually relevant comic book heroes (or, as we shall soon see, Anti-heroes) of the modern age. Yet, throughout this rich legacy, one book in particular stands our from the rest. 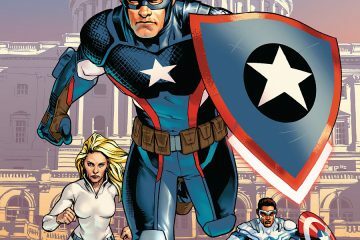 Among fans, it’s a book that ranks up there with such giants of the form as Alan Moore’s Watchmen, Frank Miller’s The Dark Knight Returns and Neil Gaiman’s The Sandman. 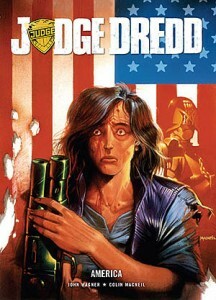 The book I am talking about is John Wagner and Colin MacNeil’s Science Fiction masterpiece, Judge Dredd: America. ‘Justice has a price. The Price is Freedom’. In this single page, we immediately begin to understand what this rich story is about, as well as the discomforting regions of thought that it is willing to go towards. What follows is an eloquent, complex and at times, disturbing tale, focusing primarily on the ‘grey areas’ between good and evil, as represented through the fascism of the judicial police state (personified in Dredd), the violence of terrorism (Total War) and the hopes and ambitions of two people caught in the middle. In shifting its focus from the title character of Dredd to two of Mega City One’s citizens, the book provides two characters with something of a juxtaposition in fortune, something realised through a series of flashbacks that lead up to the terrible imagery at the story’s beginning. On one hand, we have the character of Bennett Beeny, who grows up to become a famous singer and acts as something of the books main protagonist, while on the other, we have his childhood friend America Jara, who becomes an activist and later a participant within the terrorist cell Total War (a group who will later go on to feature as the main antagonists in the epic Judge Dredd: Total War). In what is perhaps one of the most memorable scenes in the entire book, we first meet the two protagonists as children living on the violent streets of Mega City One (see right:). Here, a young Benny and America are accosted by a Judge in an exchange that will leave a lasting impression on the rest of their lives. Whilst the meeting leaves Benny terrified of the Judges, America stands defiant and it is this experience that will progress and build its way into their future lives. The rest of the novel follows their growing up, with Benny becoming famous and America disillusioned, something that will lead to her joining Total War. The relationship of these two character to one another and their reuniting in later life is key to the pathos of this story. Theirs is a tragic, doomed love story that is caught between the worlds of chaos and order. I will not spoil what happens, but it’s a touching, if at times unsentimental story that tugs at the conscience, just as much as the blood and bullets flow. But what of Dredd, you might ask? How does he feature in this tale? Since Dredd’s beginning there has always been questions over the nobility and virtue of the Judges as the harbingers of law and order. This was further solidified in such tales as ‘Revolution’ and ‘A letter to Judge Dredd’, both of which form parts of the Democracy storyline, of which America is sometimes included within its canon. These are stories that question the cultural, sociological and political ramifications of Dredd’s violent brand of justice. Whilst at times reveling in their satire and challenging preconceptions of good and evil, the stories allow readers to question their own thoughts, whilst demonstrating the dangers that such extreme views (both left and right) might have on society as a whole. While Dredd may be among the most amicable of the judges at the conclusion of America, he is still nevertheless part of the police state, just as Total War, in their fight against fascism, also demonstrate terrible violence through murder, assault and terrorist acts. The result is a fascinating look at the power of comics as a medium for storytelling and meaning. What Wagner does so well is that he provides the reader with challenging ethical dilemmas that can be allegorical to our own. It’s a message that couldn’t be more poignant and closer to the truth. Judge Dredd: America is available at all good comics and book stores across the US and the UK. Talking Valiant Episode #43: The Future is Coming with 4001 A.D.
Talking Valiant Episode 7: Harbingers, Hunters, Omegas, Oh My!